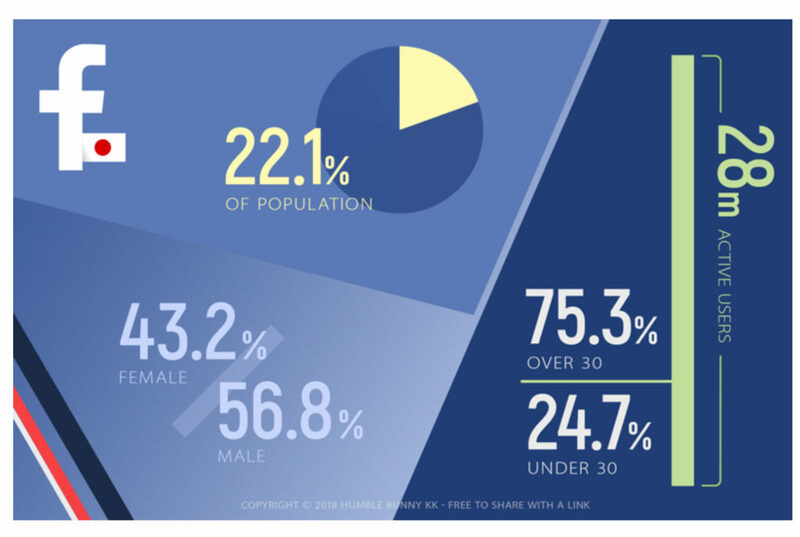 Facebook is the mature social network in Japan, with survey data showing that nearly 75% of its users are over the age of 30. Males now outnumber women at 57% overall, and even more in older demographics. It seems like younger Japanese social networkers are going to Instagram and Twitter, while leaving Facebook for the adults. The difference in usage rates between teens and twenty-somethings is especially drastic. Facebook usage among full time workers in their twenties is almost double that of college students. This could be due to the fact that Facebook is seen as a more professional networkand even used for job hunting and business networking by young professionals in Japan. We think more Japanese people are adopting Facebook in their 20’s as a way to have a professional face online when they begin their careers. Additionally, Facebook ads in Japan have the highest CPC (cost per click) globally. This indicates that ads are highly competitive in Japan. We think companies are fighting hard for Facebook ads because its older and more affluent user base is more lucrative than that of other social networks. Because of this, Facebook is a great place to put your brand if you’re trying to connect with an older, more mature, audience in Japan. On top of that, their targeting platforms for ads are very precise. Next Post How is Instagram working in Japan?